Hybrid Camera Revolution: Pay 50% Less For Your Blackmagic Pocket Cinema Camera Storage! Pay 50% Less For Your Blackmagic Pocket Cinema Camera Storage! One of the crticisms of the Blackmagic Pocket Cinema Camera has been the high cost of the fast UHS-I SDXC cards required to record the camera's 233mbps ProRes codec. Blackmagic's recommended cards, from Sandisk and Delkin, are both expensive. As of this post, the Sandisk 64GB Extreme Pro is $132.37 and the Delkin 64GB Elite is $131.51 . 64GB would be a lot of memory for any other camera. But it only gives you 37 minutes of recording time with the BMPC . Fortunately, there is another option, which will give you over an hour of recording time. Adata UHS-I cards record at the same advertised 45MBps write speed as the Delkin, and you can get a 128GB Adata Premier Pro SDXC card for $125 . I went out and shot with the 64GB version of this card today, and had no issues. The camera recognized the card and there were no dropped frames. Twice the storage for less money, not a bad deal. If anything here has helped you make a buying decision, please click on one of the links above or the display ads below. It won't cost you anything extra, and it will help keep these blog posts coming. Thank you! Panasonic GH3 $998 Deal Ends Tonight! Sony NEX-EA50 - $2949 Deal - NOW $2725! New Sony DSC-RX10 - the Panasonic Killer? SALE - Panasonic G6 w Lens - $638! The Blackmagic Pocket Cinema Camera Has Arrived! 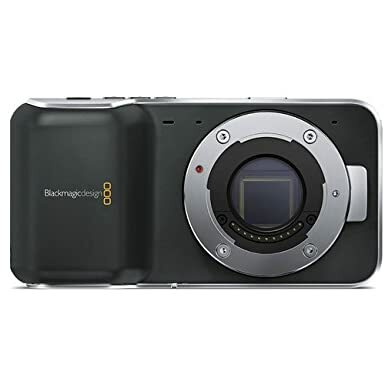 Blackmagic Pocket Cinema Camera On Its Way!